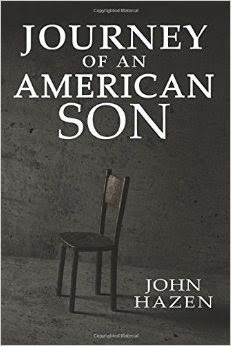 Today we are interviewing John Hazen, author of the historical suspense novel Journey of an American Son. I came to writing novels relatively late in life. It was always one of those things I wanted to do but “never had time for”. Well, once I started I haven’t looked back as Journey of an American Son is my third published novel and I’m putting the finishing touches on my fourth. I have degrees from Rutgers, The New School and NYU that buttress a lifelong passion for learning and a love of history (all of my novels have a historical component to them). My wife, Lynn, and I will be celebrating our 35th anniversary this June. We live in New Jersey and I’ve worked for the State of New Jersey for thirty years. We love to travel, and the experiences of those travels often find their way into my writing. My reading tastes are eclectic, ranging from histories to classic novels to an occasional piece of modern trash. My absolute “must reads” are Harper Lee’s To Kill a Mockingbird, J.K. Rowling’s Harry Potter series and Doris Kearns Goodwin’s No Ordinary Time. Describe the plot of your book, “Journey of an American Son,” in a few sentences. In 1920, Benjamin Albert, who had been sent on a business trip to India, is framed for murder and thrown in a Calcutta jail after he asks to many questions about his company’s operations there. Abandoned by his own government, his wife, Catherine, takes matters into her own hands and battles a ruthless and unscrupulous corporation abetted by a corrupt colonial government to prove his innocence and free him. Spanning the globe in an era of great change, Journey of An American Son takes readers from the Jewish ghettos of 19th Century Eastern Europe through American immigrant-clogged streets, the trenches of war-torn France, the geisha halls of Japan and the grimy backstreets of Calcutta. This book will appeal to history buffs, to fans of suspense and to those who simply love a good story. What inspired you to write a book about a man framed for murder and his case complicated by prejudice? The original inspiration for this book came from a diary my grandfather kept on a trip he made from Boston to Calcutta in 1920. Of course, his trip was a lot more mundane than what’s presented in this book, although he did encounter lepers, geisha girls, British army officers and silent film starlets. Anyway, I decided this trip made a great backdrop upon which I could build a story. I always try for my books to have a broader message beyond just the story and, being aware of the conditions at the time both in America and in India, it seemed to come together that there were abuses and arrogance on the part of corporations and governments that would silence a man who asks too many questions. Add to this the fact that the man is Jewish who is asking questions about the treatment of dark-skinned Indians, it seemed to be an explosive combination. Tell us about the protagonists, Benjamin and Catherine. Benjamin is a composite of a number of people I’ve known or heard about over the years. He’s part my father, part my father-in-law, part my grandfather. He is, in a word, brilliant. He’s very matter-of-fact but also self-assured about his brilliance. He’s a non-observant Jew but he’s keenly aware that he is Jewish and that is how the world views him. Despite he himself being the subject of prejudice, he is prejudiced against “coloreds”, as he calls him. It isn’t until he makes this trip that he has a sort of epiphany on the subject, which in turn proves to be his downfall. Catherine came entirely from my imagination. I’ve been told that a key ingredient of my writing is that I write about strong women. She is perhaps one of the most complex characters I’ve ever written. On the one hand, she’s a modern woman, being college-educated at a time when many women were not. On the other, she’s old-fashioned being content to be an at-home mother once her son, Harry, is born. She is not Jewish but is willing to face the stigma of the time of marrying outside her faith. When she hears about her husband’s conviction and incarceration 8,000 miles away, she nearly loses all hope but is soon able to draw on an inner strength she didn’t even know she had and she takes on seemingly invincible forces. How did you capture 1920s India? As I mentioned, the main source I used was the diary my grandfather kept on his trip there. My grandfather was a research chemist and, like a good scientist, he was extremely meticulous in his recordings. I’ve also done a fair amount of reading on the time and place to give me the feel. Is there an author who influenced your writing style? I can’t specifically cite one author over another as an influence. As I mentioned, my tastes are eclectic. Generally, I know what I like when I see it but often I can’t make a definitive statement as to what component of that author’s style that I like. I have several things in the works. I’m actually reworking the first novel I ever wrote but had never released, hoping to get that ready for publication. I’m also working on a sequel to my book, Fava. It’s the only book of mine that readily lends itself to a follow-up book. I’m also attempting to turn a couple of my books into screenplays. I’ve been told that my books would make good movies and I have a friend in the industry so I figured I’d give it a whirl. Just that I’m confident they’ll like Journey of an American Son and hopefully they’ll walk away with something meaningful after reading it. One person who read it said that my motto should be: You’ll laugh, you’ll cry, you’ll think. I like it! I first met Ben in the spring of 1916. Our initial encounter could have been disastrous. I worked at the Rutgers College library. It wasn’t that I needed the money. My mother demanded that I work part-time to build my character. I’m still debating whether that worked or not. She was a close friend of Mabel Smith Douglass, who was leading the drive to open Rutgers to female students. Mother wanted me poised to enroll the minute that happened. She figured that physically working at the university gave me an advantage. She also paid for an apartment in the middle of New Brunswick for two of my friends and me. I felt quite the independent young lady. Anyway, it was a Saturday afternoon on a beautiful day in late May. The library was practically deserted. I was wheeling a cart full of books I had to return to their shelves in the biology section. I turned a corner and saw him sitting alone at a table, surrounded by his notes and a number of volumes. He didn’t see me at first. He was studying very intently, but he wasn’t staring at his books. He was concentrating on a dollar bill he held in his hand. I was fascinated by his catatonic state as he gazed at this bill. I found him to be quite handsome, too, with his chestnut colored wavy hair and penetrating dark brown eyes. He was dressed in what could best be called workman clothes, a blue denim shirt, black somewhat worn but still serviceable slacks and rubber-soled light brown shoes. He certainly was not the typical college student I ran into every day. I decided to walk over and speak to him. “So, is that the first dollar you ever earned?” I airily asked as an icebreaker. My voice startled him as he sat upright from his slouched position. I could tell he was weighing his answer. He later told me that he actually mulled over the possible responses he could make to this question. He was in a foul mood and his initial inclination was to say: “Just because I’m Jewish doesn’t make me a miser!” But when he looked up from his seat in the library and saw (his words) the most beautiful hazel eyes he’d ever seen in his life, he quickly reconsidered. I had no idea at the time (nor did I really care) that he was Jewish and he made a wise choice in not responding in the way his original instincts guided him. I probably would have turned and stormed away, never speaking to him again. I stood there a few seconds, uncomfortable and dumbfounded. I turned to walk away as he called after me. I slowly lowered myself into a seat across the table from him, but I still didn’t know what to say after that. Ben couldn’t keep his eyes off of me. I have to admit I was rather a stunner back then. He said he especially loved the dimple that appeared in my left cheek when I smiled. I was hoping he’d be determined to do whatever it took to keep me smiling for a long time. There was silence for a few moments more until I asked the question most on my mind. “Yes, one of them. He got sick when I was three years old. I never did get a straight answer what he had but from what I could gather I always suspected it was cancer. The doctor told him it would be best for his health to go to a warm climate for a while. He traveled to North Carolina, worked two days in the tobacco fields down there and then died that night. He made all of five dollars for his efforts. Each of his four children got a dollar as a remembrance. My mother has the other. “My sister, Bessie, spent hers within a week. As far as I know, the rest of us still have ours. I carry mine with me all the time. Occasionally, when things are going tough I’ll pull mine out and look at it. It puts things in perspective for me when I think of what he had to go through, immigrating to America with only about twenty words of English in his vocabulary, living in the tenements of New York before settling in New Brunswick to raise his family and build a new life. Then cancer cut him down before he could really get going. Looking at the dollar reminds me of my obligations and responsibilities. The look on his face showed that it wasn’t okay. He changed the subject. I laughed, but was very taken by the compliment. He smiled back but then just as quickly got serious again.